The holidays are all about getting together with family and friends and sharing meals and memories. The only problem with all of that is if you are the one doing the hosting, you usually end up spending all of your time in the kitchen prepping, cooking and cleaning. That is why when we decided to have family over the other night, I decided to stock my freezer with Nestle frozen foods to make my life easier. I swung by Walmart and picked up some Stouffer’s Party Size Entrees (Macaroni & Cheese and Lasagna), a Digiorno Rising Crust Pizza, and Edy’s Limited Edition Slow Churned Ice Cream in Very Merry Eggnog and Peppermint Wonderland flavors. I grabbed a prepackaged bag of salad and some frozen bread sticks and called it a day. About an hour before everyone came over, I stuck my Lasagna, Mac & Cheese and Digiorno in the oven and then I was able to sit back, relax and enjoy the company of my parents, in-laws and my sister and her husband. I dressed up my lasagna and pizza with a little crushed Italian seasoning and fresh grated Parmesan and topped my mac & cheese with some panko bread crumbs for a crunchy topping. I decided to go with paper plates and napkins and plastic cups and silverware so that the clean up was as easy as prep. It was so nice to be able to have people over to share a family meal without having a million dishes to wash or any real work to do in the kitchen. 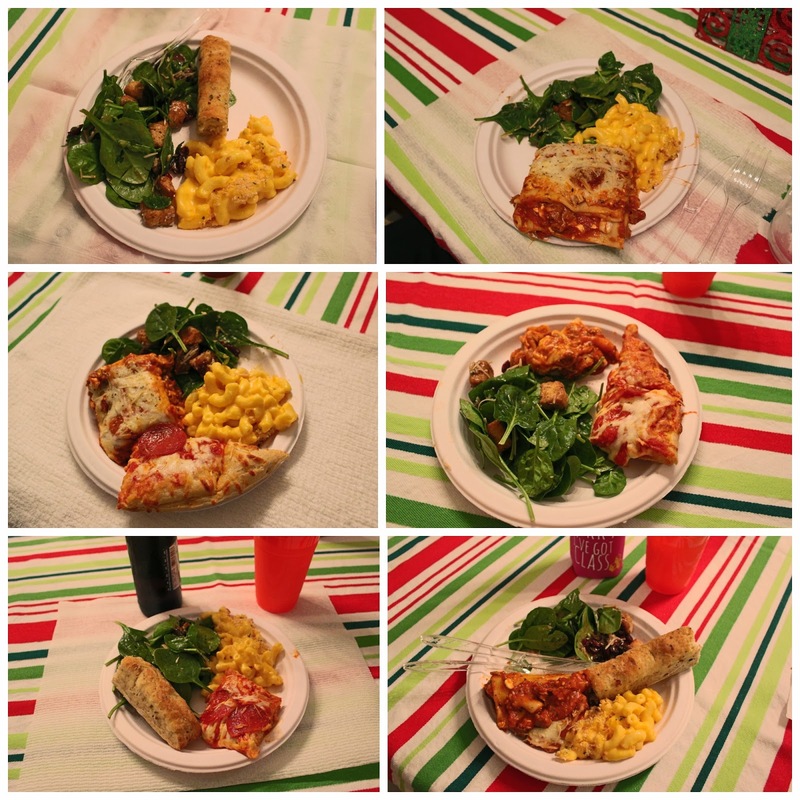 Our pizza, lasagna, mac & cheese, salad and bread sticks easily fed eight people with tons of leftovers to spare. 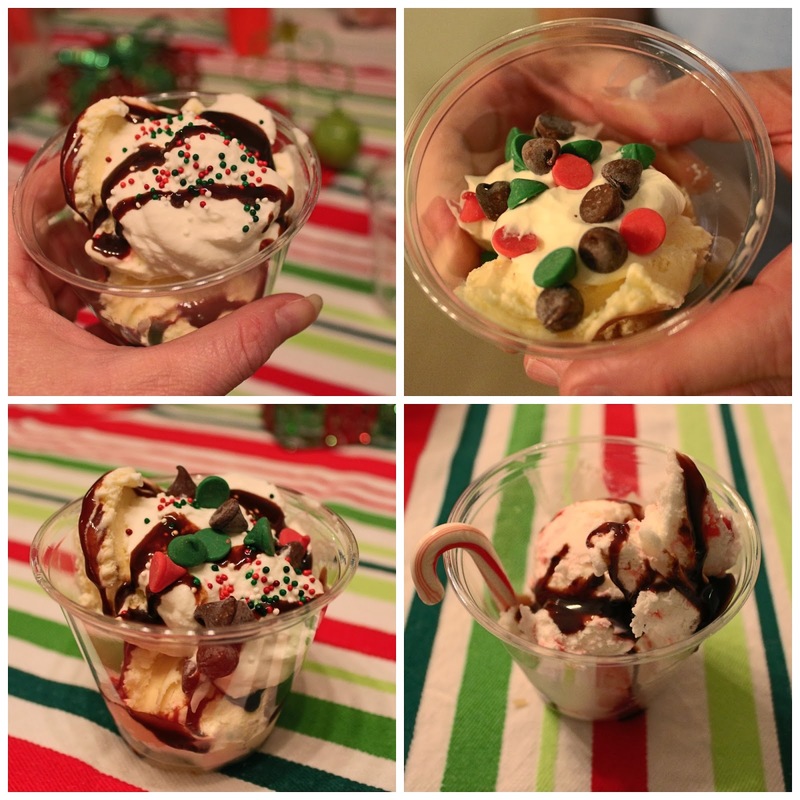 After dinner I set up an easy, holiday ice cream sundae bar with Edy's Very Merry Eggnog and Peppermint Wonderland, chocolate syrup, Nestle Tollhouse Morsels (in the Christmas colors), sprinkles, candy canes, homemade flavored whipped cream and more. I actually made the whipped cream from scratch the night before using heavy whipping cream, sugar, and Nestle flavored coffee creamers in Peppermint Mocha and Eggnog Spice. It was so easy and it added a fun element to our sundaes. Recipe HERE! The best part about this meal (aside from the minimal work involved) was that everyone was able to customize their plates to their own preferences and appetites. Everything was served family style so people could have as much or as little of everything as they liked. Everyone was stuffed by the end of dinner and dessert and it was so nice to feel relaxed instead of frazzled and tired (which is how I usually feel at the end of having people over for dinner). Looking for more holiday entertaining ideas? Check out Nestle's digital magazine for tons of inspiration! You can connect with Nestle on Twitter and Facebook too!